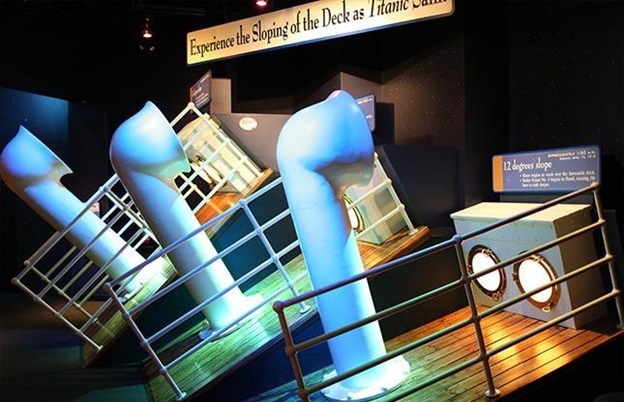 The Titanic Museum in Branson offers guests interactive experience with a tribute to passengers and crew who perished when the RMS Titanic sunk in the Atlantic Ocean during its maiden voyage. The museum is a beautiful replica of the famous ship, catching the attention of visitors with its bow ripping the chilly ocean water. The Titanic Museum offers every visitor more than just a typical museum, with hands-on experience like walking the grand staircase, the hallways, first class cabins, the bridge, and even touching an iceberg. The ship features a crew of talented cast of characters from the “Titanic,” dressed in authentic costumes. This family friendly museum offers an enchanting two hour walk-through, interactive experience that you’ll not forget. This majestic attraction in Branson which is continually receiving positive reviews has been awarded Trip Advisor’s Certificate of Excellence. The Titanic Museum Attraction hosts special events throughout the year, so it’s always interesting to visit the museum where brave men, women, and children of the ill-fated ship are greatly honored. This year 2016, you will find the most impressive artifact on display in the ship, the violin played by Bandmaster Wallace Hartley. The violin is a gift from his fiancé, where there’s a plaque affixed to the tailpiece of this precious instrument. The violin will only be on display in the museum until May 29, 2016. The only bible to survive from the Titanic is another significant artifact that is also on display in the museum. The museum also pays tribute to the musicians who were aboard during its ill-fated voyage with a grand piano and reproduced images of each musician. Visiting pianists can have the chance to play a tune or two. In the museum, you will see a memorial wall that features the names of 2,208 Titanic passengers and their stories. Of these passengers, 133 of them were children. Their experience, thoughts, and feelings are recreated in this unique form of display at the Titanic Museum. As visitor to the museum, you can have the opportunity to step into the Captain’s bridge and the chance to learn how to send an SOS signal and see equipments such as the steering wheel, the mapping table, and the compass. The Titanic Museum also features ‘TotTanic’ ship simulation which is one of the most engaging simulations that was ever created. The visitor can have the opportunity to use a real ship-steering wheel and telemotor that are similar to those used on the actual Titanic ship. This interactive experience will be felt around the last 37 seconds before the ship hit the iceberg. The objective of the simulation is to avoid the iceberg by using both the steering wheel and telemotor to turn the ship to avoid the impact. If the visitor can avoid the impact, it saves the Titanic and everyone on board. An interactive experience on the famous ship is an interesting activity to enjoy at the Titanic Museum as it offers a wide range of interactive action activities.